You can never have too much padding! ≈ Comments Off on You can never have too much padding! 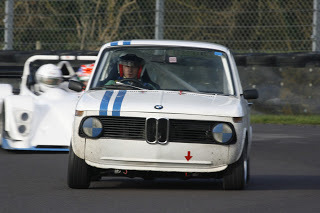 A customer had a fairly heavy “off” at Castle Combe last Saturday. The car became unsettled as it crested Avon Rise, ended up sideways and careered at high speed head-on into the Armco on the outside of the circuit. The car rebounded violently and the front passenger seat broke free of its floor mounts leaving the passenger to be thrown around inside the car. His helmet made heavy contact with the unpadded roll cage directly behind him. What this highlighted to me was that even though a safety cage may be well out of the normal contact zone, other factors like the seat coming free from its mountings, or the car body distorting significantly, can result in the occupants of the car getting fairly rough treatment, bruising, cuts or worse from contact with things like the cage and any other potentially damaging items in the car. If you have a roll cage then fit it with roll cage padding. If you stripped the inside of the car to reduce weight, cover all the welded seams and other sharp edges with padding. You might also consider sheet padding material for hard surfaces in the cockpit area. If you’ve taken out the door linings fit padding to the side intrusion tubing. Demon Tweeks stocks suitable roll cage and sheet padding here – Demon Tweeks . I also came across this site that looks like it caters for all needs – Safety Devices . Googling “Roll cage padding” throws up a whole heap of other suppliers. Now that the 2015 is getting well underway why not get out there and cover that bare metal now. It’s lightweight, easy to fit and pretty cheap so well worth it. As an aside, if you are also looking for track training you might find an instructor reluctant to ride with you if the car is all bare metal and sharp edges. We know that our December track day has yet to run, but as it’s only got a couple of places remaining at the time of writing our customer reservations list is pretty much complete for this year. So here’s what booked with BHP TrackDays during 2014 in ascending order of popularity listed by make. The top manufacturers were BMW, closely followed by Renault. Then came Caterham, Mazda and Porsche in descending order giving us our top five makes for 2014. In terms of individual saloon car models, the Renault Clio just beat the BMW 3 series (including M3 and variants) into second place (35 for Renault versus 33 for BMW). The Caterham 7 was the leading sports car make and was fairly comfortably ahead of their rival the Mazda MX5. That’s pretty good going for a car that’s been around for over 50 years. The MX5, however, remains the most successful sports car ever worldwide. I feel sure that one of the first jobs you will want to complete on your track day car is upgrade the road-going brake pads for a higher performance type. The choice of competition brake pads is huge and I’ll leave any discussion on that, including other subjects, to future articles because it’s such a big subject with so many variables. However, one important task, once you’ve decided on an upgrade, is to bed the new pads to the discs properly. This article outlines typically what’s required, but always check the manufacturer’s information for any specific recommendations as well. Before fitting new pads you might like to check out the condition of the rest of the braking system first. Use a proprietary brake cleaning spray to clean off accumulated brake dust and ensure that the brake callipers are working properly. Some manufacturers require you to fit new discs if the previously used brake pads were of different material to the new ones. This is because the efficiency of their pad material can be compromised by incompatible pad material on the surface of the used disc. Check the manufacturer’s literature before you start. Some manufacturers also advise against the use of pre-bedded discs. If you are able to use the old discs but they are badly scored or showing significant wear ridges near their service limit it’ll be worthwhile replacing these anyway, but some wear in the discs can often be preferable to a brand new disc surface. Again a check with the manufacturer will clarify the situation for you. If you do fit new discs they may need bedding first using a different technique before you fit the new pads. I’ve covered this below. Change the brake fluid if this hasn’t been done recently and perhaps upgrade to a higher performance Dot 5 fluid, but check that your system is compatible first. Not all braking systems are suitable for Dot 5 fluid if it is silicone based. Competition cars and advanced driver pure track cars only: Before bedding new pads on old discs you can consider chamfering the edges of the pad at an angle of about 45 degrees so that the pad material is clear of the wear ridges on the non-braking surfaces of the disc. Why do the discs need bedding? All discs, whether for road, track day or competition use need to be bedded in to stress relieve the castings. You can purchase discs that have already been pre-bedded, but if this is not done and then if the discs aren’t bedded there is a risk that cracks develop in the disc or even of disc failure resulting in wheel lock-up with all the consequences that might lead into. Check with the brake pad manufacturer’s instructions first about the use of pre-bedded discs as mentioned above. Many track day cars are also road legal, so it’s possible to bed the discs on the road, or to start the process on the road and complete it on the track. If the car is a pure track day car then everything is carried out on-circuit and the process on-track is very similar to bedding competition discs. It’s preferable to use serviceable but used brake pads for this process, but do check about pad compatibility issues first and make sure that any deposited material from the “bedding” pads will not compromise the efficiency of the new pads. On the road for the first 5 – 10 miles try to carry out repeat gentle braking from around 60 mph down to around 30 mph having due regard for other road users, speed limits and the law. Try to do multiple braking applications in succession. Groups of 5 with a gap is generally considered an ideal. Over the next 100 – 150 miles or so avoid abrupt full stops where possible, but gradually increase braking pressure from the normal braking you would apply in moving traffic up to maximum braking effort by the time you have completed the full distance. During the process, if you examine the discs you may see, depending on the materials, a gradual transition in colour across the disc until it is a uniform light blue tempered colour. On-circuit it’s all very much easier. Over the first 5 – 10 miles (3 – 6 laps of Castle Combe Circuit) from an initial low speed with light application of the brakes gradually increase speed to full track speed but continuing to only apply a light braking application. That is, apply light braking over a longer than normal distance. Complete the bedding process over a final lap with moderately heavy application of the brakes. You should then complete a cool down lap trying to avoid using the brakes and return to the paddock. Again the colour transition should be observable, and for increased sophistication, you could apply thermal paint to the outside rim of the disc to confirm that sufficient temperature had been achieved for the process in the range 400 – 500C. Note: When you are back to the paddock do not put on the handbrake or sit with your foot on the brake with the car stationary. This can lead to warped discs caused by the uneven cooling where the hot pad is in contact with the hot disc. Why do the pads need to be bedded? Particularly if you are bedding new pads to old discs, full contact of the pad surface with the disc won’t be achieved until the new pad conforms to the contours of the worn disc surface. The new pads are likely to have various volatile chemicals embedded in them left over from the manufacturing process. It’s necessary to boil or burn these off in a controlled manner before the brakes can be used to maximum efficiency. If the brakes are used too hard initially, the very rapid boiling off of these volatile substances can cause the brake pad surface to crack and break up, sometimes catastrophically. Also too hard application immediately can cause these residual resins etc to glaze on the pad and disc surfaces leading to poor performance and brake shudder. The materials of the pad will have some compressibility when new and the aim should be to stabilise this so that consistent braking and a firm pedal results. Lastly properly bedded pads will give improved braking performance and last longer. The idea is to get some initial heat into the pads. Approximately 4 – 6 retardations using a moderate brake pressure from a speed of about 90 mph down to around 50 mph should be about right, accelerating back to 90 mph and allowing around 400 yds or so between each brake application. The idea is to get heat into the brakes without exceeding around 400C. Difficult to judge without fancy equipment or the application of thermal paint to the discs, but following the above procedure should be fine for most applications. Don’t be tempted to use higher speeds at this stage because the energy being dissipated in the brakes increases exponentially with speed. It’s also important not to brake and apply power at the same time (dragging the brakes), so no left foot braking for example. Immediately after the initial bedding process is complete apply medium to high pedal pressure and brake from around 100 mph (some sources recommend 110 mph) to around 50 mph. Do not lock the wheels or induce the ABS, if fitted, to operate. Regain speed and allow around 4 or 5 light pedal pressure recovery braking periods, then repeat the high speed, high pedal pressure braking allowing a minimum of 500 yds between the high speed braking points. Repeat this process another 4 or 5 times. It may be that after the initial and high speed processes the brake pad bedding is not complete ie the full pad surface is not yet in contact with the disc and pad material has not transferred to the disc. If this is the case repeat the whole process from the initial bedding process. The distance between corners and thus braking points on most racing circuits will naturally allow the above procedures to be carried out without causing any significant inconvenience to other circuit users if a bit of common sense is applied. On entering the circuit, the brakes (and the tyres for that matter) are cold and need to be brought to their operating temperature such that good brake performance is achieved and warping of the discs is avoided. At the same time as you are increasing speed and warming the tyres, bring the brakes up to temperature by gradually increasing the brake application pressure over at least one lap. Before leaving the circuit, likewise allow the braking system at least one cooling down lap with minimal or zero braking as far as possible. When you get back to your spot in the paddock, don’t sit with your foot on the brake or you’ll likely warp the discs. Similarly don’t apply the handbrake – some handbrake systems work on the rear pads leading again to warped discs. What should I check before I take my car on track? ≈ Comments Off on What should I check before I take my car on track? I see fairly frequently on forums, posts asking for advice on what car preparation needs to be done before going on track for the first time. If your car is already road legal and MOT’d the answer is actually not much at all, but here are a few things that spring to mind that you might like to think about. The list is just a guide; it’s not exhaustive and no warranty is expressed or implied! If your car has removable towing eyes, it’s generally recommended to fit them front and rear before going on circuit. On some circuits it’s mandatory; at Castle Combe it’s optional. The marshals will use the tow eyes if they can to recover your vehicle if it breaks down. If towing eyes are not fitted then the recovery crew will attached tow straps as best they can and to wherever they can! Track driving will wear tyres out much more quickly than during normal road use. I’d recommend that your tyres have a minimum of 3.5mm tread. Check that the tyres are free from cuts and splits and that all the balance weights are still on. Also don’t forget that your tyres must be road legal at the end of the day if you intend to drive home in the track car. Check that your brake pads, discs and hoses are in good condition. Make sure that you have adequate life left in the brake pads, the brakes are working efficiently and none of the callipers has seized. Check brake fluid levels, and make sure there aren’t any leaks. Also change the brake fluid if this hasn’t been done recently. Brake fluid becomes contaminated with water over time and this can cause partial or complete brake failure because of the heat of heavy braking. So if in doubt, change the fluid. Check your oil and water levels and that all the hoses, filters and belts are in good condition. Continue to check the fluid levels throughout the day. If you have any doubts get the car checked over at a reputable car service centre. Check the steering, for freedom from play in the column, rack or steering arms. Check also that you don’t have excessive play in the wheel bearings. We changed the front wheel bearings on our track Caterham a while back and couldn’t figure out during testing why the brake pedal travel suddenly increased alarmingly. Simple really; the bearings hadn’t been seated properly; under load they moved and the resultant play in the bearing was knocking the front brake pads off the disk – hence the pedal going to the floor rather alarmingly. I think many of us have heard the apocryphal story about the can of Coke caught under the brake pedal, but here’s a real one. My Caterham now has several strategically placed stickers on the back to disguise the dents in the boot from when I forgot about the trolley jack! You should have a properly fitting and suitable helmet eg motorsport or motorcycle that meets a recognised standard. At Castle Combe you can borrow a helmet at the circuit, but really it’s best to have your own. If you do borrow one from the circuit, make sure it fits properly. Ask for advice about this if you are in any doubt. The straps must be done up before you go out on the circuit. If you intend to drive an open-top car, then a full face helmet will be required. If you’ve stripped out and lightened a road car for purely track use, ie taken out seats, carpets, headlining, soundproofing etc, we strongly recommend that you cover sharp edges that could injure the driver or passenger in an accident, or even from just getting in and out of the car. Horrific injuries are possible from the unprotected tack welded joints that get exposed when the interior is stripped back to the shell especially around the foot well area and where your legs and knees may end up in an accident. If you plan to enter in an open top car, then the manufacturers homologated roll-over protection device, if provided, must be fitted. An FIA approved type will provide enhanced protection. Classic cars by reason of age often do not have roll-over protection. Some roll cages include a brace that extends into the passenger space and foot well to provide extra stiffness. If you have this type of cage and you intend to carry a passenger you will be required to remove the strut when the passenger is in the car if the strut is judged to be a potential safety hazard to the passenger. Whereas standard seat belts are perfectly acceptable, competition style harnesses (4 or 6 point) will give you better support. Make sure your seat belts are in good condition without tears or frayed areas and that appropriate anchorages are used and are secure, especially if you are fitting harnesses – which will need specialist expertise and advice. Both you and your passenger must be suitably clothed. This means your arms and legs must be covered up while you are on the circuit ie no T-shirts, shorts or skirts. This is to protect bare skin from cuts if any glass gets broken. Race overalls are not a requirement, but customers often do wear as they provide enhanced protection. Cameras must have a secure mounting. If you have a sucker mount then a secondary means of restraint (eg a tie wrap or a restraining cord) must be provided to prevent the camera from flying about inside the car, or falling onto the track if the suction mount fails. Hand held cameras including mobile phones are not permitted under any circumstances. When I first started trying my hand at track days they were really just starting to become popular. I’d just lashed out on a mid-life crisis second hand Caterham 7 and I took it to Brands for an Easy Track day on the GP circuit. Be warned! Once you start, the bug really bites and it becomes an addictive pastime that can last a lifetime. All I knew about track days and track day cars at the time was that the Caterham was clearly designed to race and from what I could glean from chat rooms it could more than hold its own on track against far more exotic and expensive machinery. I’d kind of put to one side the bit about a lot of the performance comes down to the skill of the driver of course. The Cat in my eyes was second to none on circuit. Now that I’ve been running track days for over 12 years, my picture about cars and their capabilities is quite a bit altered. Also our customers, except for a very few who I could probably count on one or two hands out of a total of literally thousands since we started up, all fall into the classification of real enthusiasts making the most out of their chosen car be it a recovered insurance write off to really exotic supercars. You’d be surprised at how many McLarens there are out there although there are a lot more VW Golfs! So if you are thinking about taking up track days and are wondering what to drive, maybe this will help you make a choice. You can spend a fortune, but it’s really not necessary. I guess the temptation when deciding what to buy is to look straight away at sports cars in their various guises. And indeed the sports car will provide a ready-made package pretty much track suitable straight from the dealer without the need for much modification. However, there are other options that will provide you with a very competent track car, probably at a fraction of the price of some sports cars, albeit you may have to put in a bit more effort to achieve that. Hot hatches for example can be really cheap to buy, cheap to modify and as long as they are effectively roadworthy don’t have to be road legal. With the cost of car repair nowadays being relatively high compared to the value of the damaged car, insurance write offs can result from what amounts to pretty superficial damage but nevertheless is uneconomic for the insurer to repair. Often the application of a little fibre glass and maybe a new panel or two renders the car perfectly roadworthy and suitable for the track. After all it doesn’t have to look like it just came out of a showroom. We had a Lotus Elise track car for a couple of years that was an insurance write-off but just needed a crack in the nose-cone repairing. It cost very little to buy and fix and gave us very good service. Most of the sports cars are going to be rear wheel drive, whereas the hot hatches and most of the saloons will tend to be front wheel drive. I’m not touching all-wheel-drive. Both front and rear wheel drive cars have their pros and cons. Because the drive train has to cope not only with power transmission but also steering, there is a practical power limit to what can be successfully handled in a front wheel drive car whilst avoiding unacceptable torque steer, and achieving the basic mechanics of getting the power onto the road. Front wheel drive cars tend to be limited to around the 200 bhp mark. Their handling will be familiar to most drivers; it’s pretty predictable but with a tendancy to understeer through the corners. Understeer is a relatively benign trait and fairly forgiving for less experienced drivers. Although the car will not follow the line requested by the driver, it will tend to remain stable. Front wheel drive is usually cheaper than rear wheel drive and possibly a little lighter too. On the downside, reliability and maintenance may be a little higher, mainly because of the more complex drive train/steering arrangement. Rear wheel drive cars are probably the most fun and most rewarding to drive. If you choose rear wheel drive there is also scope for different engine layouts ie front, mid and rear engine, all with different handling characteristics. Out-and-out horse power is not a limitation either with a good choice of naturally aspirated, turbo and supercharged models around. Rear wheel drive will, however, be less forgiving to the bold driver than front wheel drive – especially in the wet or greasy conditions, but let’s face it, that’s half the fun! Here’s a selection of the most popular cars for you, taken from our bookings records in 2012/13; there are many more you can choose from. Other favourites are the Subaru Impreza and the Mitsubishi EVO in its various evolutions. Or how deep is your pocket? Actually you don’t need to fork out much at all to get you going on track. Straight off the road the car will be fine, although you will in all probability find that on-track the brakes quickly start to become ineffective once your competence and speed starts to build. Road-going brakes are generally going to quickly overheat under sustained track driving conditions. The car will also probably tend to roll quite a bit in the corners if it’s a family saloon. So what to fork out from your hard-earned? Well I’d start with making sure the car’s general mechanics are up to scratch before you go anywhere near the track. The bodywork should, of course, be sound. · No sloppy joints or bushes. · Steering properly aligned and rack in good fettle. · Braking system with new fluid; Dot 4 or better. · Plenty of wear left on the pads. · Discs not seriously worn or grooved. · Engine oil change with new air, oil and fuel filters if the car’s service history is a bit of a mystery. · Coolant fresh and no leaks. · Check the seats are secure and the seat belts are in good nick. · Tyres should have plenty of wear left in them and at least 3 mm. I think at that point I’d stick it on the track and try it out. · Get some quality instruction from a qualified instructor before you do anything else (ARDS Grade A recommended). No really just do it! This will be by far the best value early upgrade to the cars performance you can do. · Better tyres more suitable for track use. · Strip out all unnecessary weight eg rear seats, carpets, headlining and soundproofing, and anything else you don’t need on the track eg radio. BUTmake sure that in stripping out you don’t leave any sharp edges unprotected and unpadded that the driver or passenger could get carved up on in the event of an accident. · GO ON A DIET! Can be a very effective weight saving measure on a lightweight car. 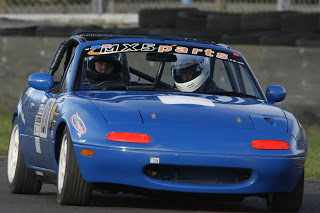 · Fit a proper race seat and harnesses for the driver (remember you also need a proper passenger seat and harness/belts if you are going to take a passenger or would like some on-track instruction. Remember that the overriding objective is to have fun, and you will get most fun by making the best use of what you’ve got with some proper instruction to show you how to do it and what driving skill to work on next. The basic car is really all you need but you may also get a lot of fun out of fiddling with it.